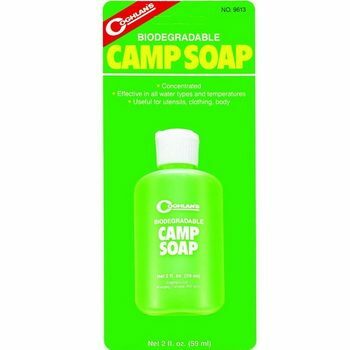 Campers that take part in ‘green’ movement have obtained an unfortunate reputation over time for being less than meticulous when it comes to the issue of hygiene. This poor picture people have had about hikers and campers is a hangover from the initial days of eco-friendly processes when the only alternative to utilizing chemical-heavy detergents and soaps was to use no soaps at all. Fortunately, this is no longer the case. Today, there is a broad range of biodegradable products including shampoos, soaps, toothpaste, and other personal care items. They will allow you to stay and feel clean while you hike or camp, and as well know that you’re not hurting the environment. This article presents a review of some of the best biodegradable soaps available on the market. It guides you through the features to look for in each soap before buying them, as well as comparing different brands based on specs and reviews. We hope that by the end of the article you will find what you are looking for. Biodegradable is a term, which implies that the ingredients utilized in making the soap can be disintegrated naturally by bacteria, rather than being left in the soil. Detergent or soap is considered biodegradable if at least ninety percent of it can be broken down into carbon dioxide, water, and biological components with about six months of being discarded. 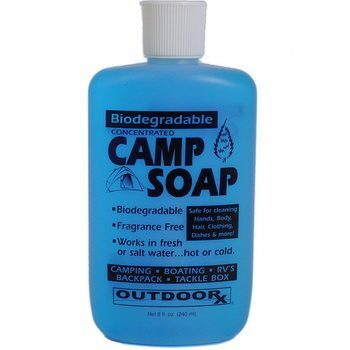 This is the first thing to look for before buying soap for camping. There are some other features that we will list below for you to know what to look for. If you are planning to embark on a camping escapade in the wilderness, you’ll need to take the necessary measures to ensure you leave a small impact in the backcountry. This means ensuring you do not contaminate the water sources or poison the soil by utilizing regular soap for bathing, washing clothes, or washing dishes. Even when you are staying in eco-friendly lodges or established camps, it’s imperative to remember that the wastewater needs to be processed before being discharged into the environment and biodegradable products don’t require much processing as is the case with chemical soaps and detergents. Apart from the environmental considerations, these biodegradable products are suitable for human health as well. 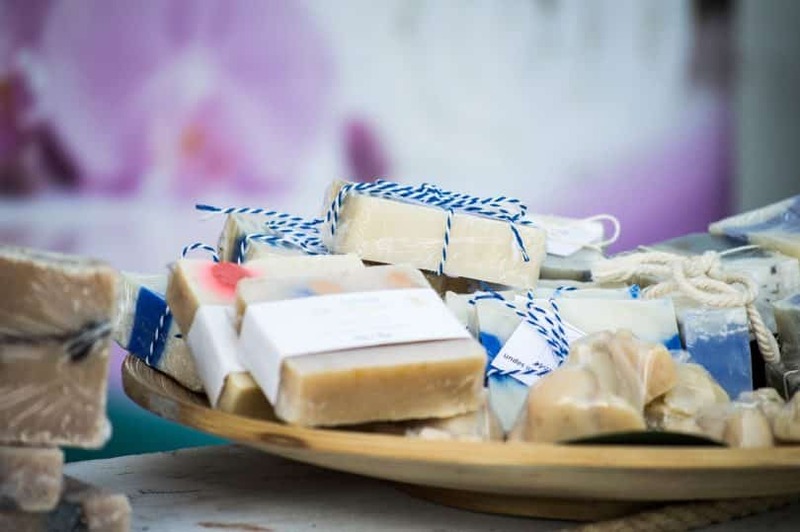 Many soaps that are not biodegradable, contain chemicals such as triclocarban and triclosan, which are quite difficult to break down naturally and are impossible to filter during the water treatment process. As a result, rivers and water become contaminated and polluted with the soap chemical, upsetting the natural water balance. Another group of chemicals which are contained in regular soaps and detergent are phosphates. These compounds can’t be processed or broken down. When phosphates get into rivers and lakes, they can lead to the formation of algae, also called algal bloom, which may end up utilizing the oxygen in the water. This causes other plants and animals in the water to die in high numbers. So, what is the right way to dispose of the water you used for bathing or the soapy dishwater within the backcountry? It’s quite simple. The first step would be to dig a two hundred feet hole away from the water sources. After that, you can pour the wastewater into the hole. This allows the soil to act as a filter and helps speed up the biodegradation, and prevents wildlife from interfering with it by hiding the scent. Digging a hole to dispose of the soapy liquid requires some planning on your part. If you are washing clothes or dishes, it’s helpful to use something like a bucket to carry the water from its source. This same process applies to other applications including hand-washing operations. No one’s objective is perfect, but it’s imperative to ensure that you don’t pour the wastewater back into the lake, river, stream, or pond. Even if you do not utilize detergents or soaps, you should be cautious when swimming in potholes or creeks where the water is scarce. This is because other products such as sunscreen, lotion, and insect repellent on your body can contaminate these water sources. It’s hazardous to consume water that you have used to wash the DETT off your skin. Therefore, dig a hole. None of these steps are complicated or inconvenient, but they can be helpful if you are looking to preserve the environment, so it’ll be available for you and others to enjoy in the future. It’s important to remember that just because a product is biodegradable, it does not imply you can wash your hair in the lakes or river. Numerous companies such as Dr. Bronners offer biodegradable products. All you need to do is ensure the shampoo you utilize is biodegradable as it claims. When planning to camp in the wilderness, even at any official campsite, always ensure you utilize biodegradable dish soap. 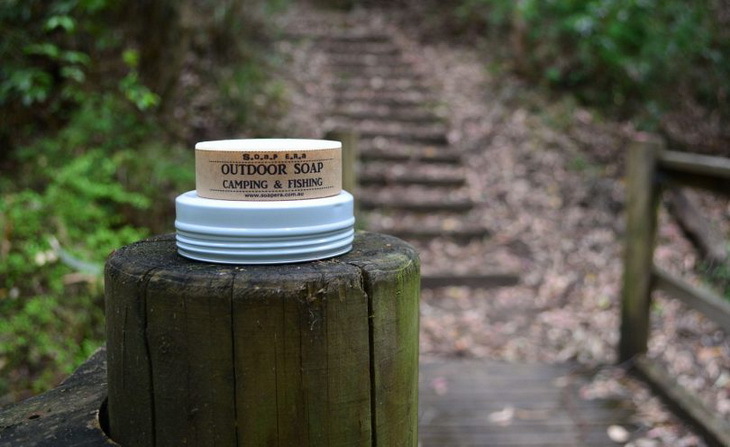 Products such as Packsoap and Campsuds are stocked in many outdoor and camping shops, or you can buy them online. 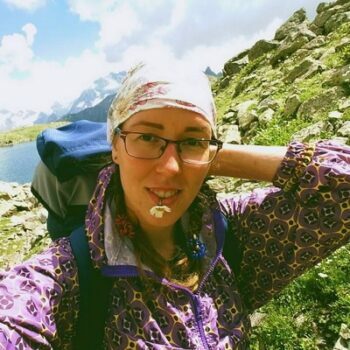 The best camping eco-friendly soaps available all fulfill the purpose of joining you in your camping trip and keeping you clean as well as not harming the environment. However, they all have different ingredients, features and reviews from users. 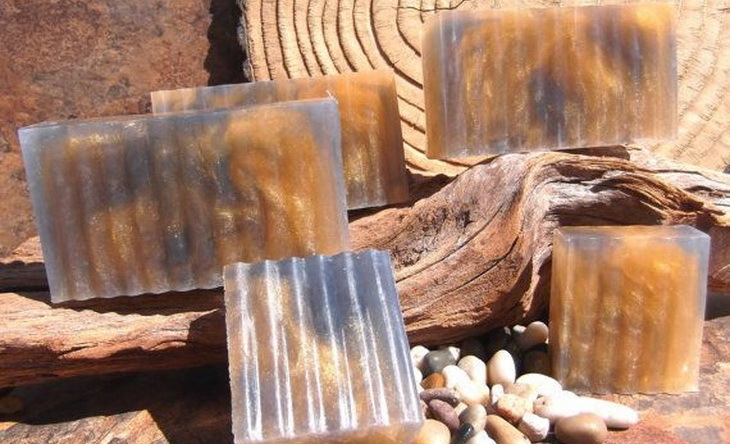 We came up with a list of the best reviewed camping soaps to help you choose the one you prefer. Specific features: Phosphate and paraben free, light green tea fragrance, environment-friendly phosphate free, TSA carry-on compliant. Description: The Sea to Summit 401 contains fifty leaves of pure, dry soap. Therefore, there is no risk spillage in your pack or luggage and no risk of having the product confiscated by the airport security personnel. The easy-to-ration leaves imply you’ll have a lot of soap to last the whole trip. The soaps are suitable for travel and camping because they are compact. They are also biodegradable and will not harm the environment. You should also note that the Sea to Summit Trek and Travel soap ought to be kept dry, so they don’t amalgamate. Due to their small size and extreme lightness, they are ideal for travelers and lightweight backpackers. They can be stored in tiny pockets until they are needed. However, the set back can be their size. Although they are fantastic for travelling, they are not great for sharing or for long camping trips. 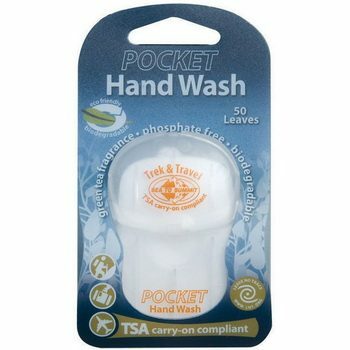 These are pretty much pocket sized and for individual use during short trips, like weekends. Related: The Travelon 83IIVEI Laundry Soap is the ideal biodegradable soap to buy alongside the other one, to wash your clothes whilst traveling or camping. 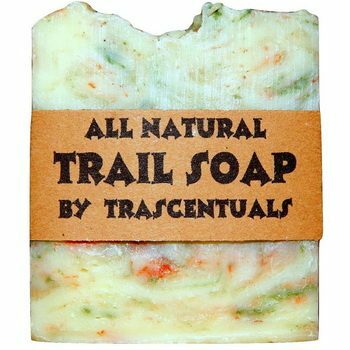 Description: The Trascentuals MVPHG Natural Soap is an all-natural trail soap. This product is ideal for hiking, camping, and all outdoor expeditions. It comes with a thick plastic case that is waterproof with a locking lid which prevents the spilling of soap inside your pack. Moreover, this soap is ideal for use on your body and hair, so you will only need one container. In addition to that, this product also features an all-natural “Forest Floor” scent. The 100% Natural essential oils are utilized to provide a natural scent while on the trail. No chemicals or perfumes are added. When you smell this soap, you will realize that it produces a fresh wood’s scent, implying that its ingredients are purely natural. Apart from that, this soap will keep your hair and skin feeling smooth and clean. It contains ingredients such as Cocoa Butter, Palm Oil, Grapeseed Oil, Hemp Oil, and others. These ingredients will not strip away the natural oils from the surface of your skin. For that reason, it’s an excellent product for your body and the environment as well. Each of these soaps is a small homemade in the United States of America. Only the company’s owner manufactures these skin care products. Every bar is created by their time-tested handmade techniques. There is no machine processing of this product. The bars are hand-mixed, hand cut, and packaged by hand to assure quality. Related: The Coleman 14871 Biowipes are the ideal wipes to take on camping trips, they will let you clean dishes, clothes or even your hands, without using the soap when not needed. Description: The All Terrain 5066 Wonder Wash is recommended for all hikers and backpackers due to the numerous benefits it provides. The All Terrain 12 is fragrance-free, concentrated, biodegradable, and specifically formulated to clean the body, hands, and face thoroughly, yet be gentle on your skin. This product is pH-neutral and mild enough for use as a shampoo, making it an ideal two in one product, so you don’t have to carry both soap and shampoo around. You can use the All Terrain for all your needs whenever you are on a backpacking venture. The size can be a bit big for some, but it totally depends on what kind of camping trip or travel you are going to do. Some prefer much smaller bottles or soaps for just a weekend trip, but if you are planning on camping for a week or so, or just sharing the same bottle between yourself and a travel mates, the size is ideal. Related: The All Terrain 4115 Lip Armor will keep your lips protected from the sun during any camping trip. Description: Bright and fresh – with a stimulating blend lemon, orange, and lime oils! 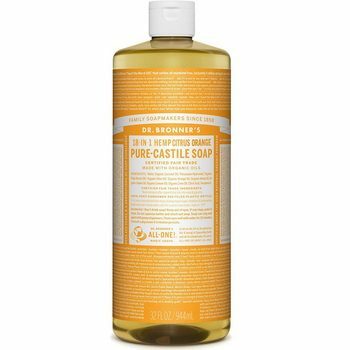 Dr. Bronner’s 8EYJ8 Pure-Castile is biodegradable, concentrated, versatile, and effective. Manufactured from organic and certified ingredients and packed in a hundred percent post-consumer recycled bottle, it is the ideal soap for your tour in the wilderness. Completely vegetable-based, the Castile liquid soaps are the “Swiss-army knives” of cleaning as they can be used for just about any tasks that involve cleaning. These ecologically formulated products are gentle enough for washing your face or hair and for bathing. They are also powerful enough for tasks such as mopping, dishwashing, laundry, and pest control. The soap is smooth and moisturizing. The vegan and organic ingredients utilized are combined with pure-Castile soap base for an emollient lather and a smooth, moisturizing after feel. Additionally, these soaps are quite luxurious and lack preservatives or synthetic ingredients, as none of the organisms or ingredients are genetically modified. The pure-Castile Liquid Soap is also packaged in 100 percent post-consumer recycles plastic bottles (PCR) that make them eco-friendly. Related: The Cape Cod YE6AA Soap Dispenser are specifically built for Dr. Bronner’s soaps, and can be used for traveling too, if you want extra comfort. Specific features: Biodegradable, concentrated, lightweight product. Best use: Backpacking, camping, hiking, traveling. Description: Stay clean, energized, and refreshed when you include the Coghlan’s 9617 Liquid Camp Soap to your backpack. This little skin care product features a concentrated formula which can be utilized in cleaning utensils, washing clothes, and even your hair. With a negligible weight of four ounces, it is ideal for backpacking and can be used with all water types as well as in all temperatures. The biodegradable plastic construction makes the product environmentally friendly. When going camping, this is the right skin care product to take with you. It’s available at a fair price, unlike other chemical soaps that are harmful to the environment. The soap lathers easily in both cold and hot water, and just a few drops can eliminate grease from your skin and garment. You can also utilize the Coghlan’s Liquid Soap as shampoo due to its ability to clean and eradicate the dirt in your hair. It works great with backpacking, it’s biodegradable and will not make the fish in the lake sick. Related: The Coghlan’s 3P758R Camp Toilet Tissues are ideal for camping, they are also biodegradable. Description: After a full day of hiking and trekking in the wilderness, you’ll find yourself dreaming of the time when you can cool off in the shower. The Dr. Bronner’s 733 Organic Castile is an ideal product for all your outdoor adventure as it gives you the smooth and refreshing feel after a long day’s hike. This soap lathers with ease and leaves you feeling cleaner than any other chemical soap. Completely vegetable-based and biodegradable, this Castile bar soap is gentle and effective on your clothes, hair, and face. If you are a DIY enthusiast, this product is also suitable for you. For instance, you can grate the Castile to create a homemade powdered detergent. The manufacturer of the Castile Bar Soap continues with their commitment and mission to create an engine for advancing and promoting positive social change. From creating Fair Trade Projects to pioneering USDA certified care products across the world, Dr. Bronners ensures just and fair treatment of each and every individual. Through its products, the company honors its heritage with positive business practices to ensure the environment is conserved. This aspect is what has facilitated the production of biodegradable soaps that are not harmful to humans, animals, and the environment. 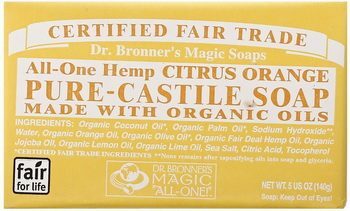 Related: The Dr. Bronner’s 56069-BA Organic Lotion is commonly bought alongside this soap, as it will allow you to use it for a better skin and or washing quickly your hands while hiking. Description: The Kirk’s 11008 Natural Castile Soap is an all-natural, hypoallergenic soap, with no synthetic detergents or animal by-products. This is an ultra-gentle skin care with no during residue and can be used for all outdoor applications. This soap, features botanical coconut oil, which is smooth on the skin and prevents the development of dry skin. 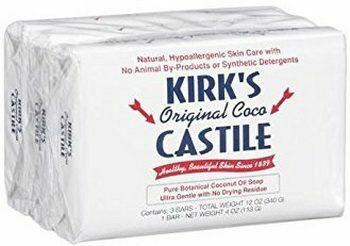 Since 1839, Kirk’s Coco Castile Soap has offered the consumer all-natural, high-quality soap at an affordable rate. According to the current national market research, this product is the top selling all-natural skin care. 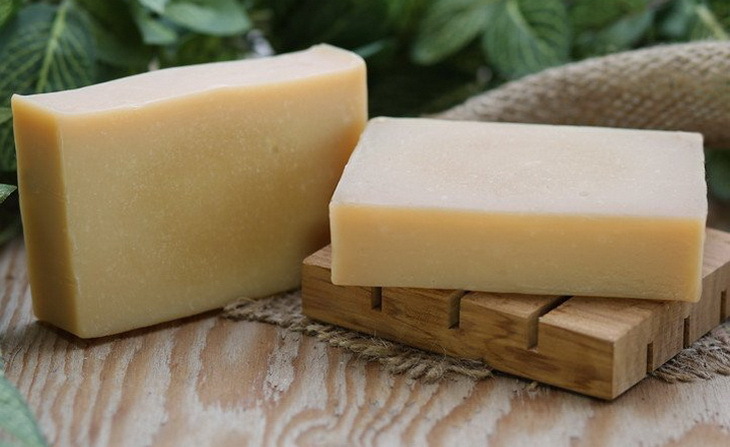 Originally, “Castile” referred to a highly-prized vegetable soap manufactured in Castile, Spain. For a long time, it was considered a “product of royalty” due to its luxurious lather and smoothness on the skin. Today, “Castile” refers to any soap produced from the vegetable. As a disclaimer, it’s imperative to note that the Castile products are not manufactured to diagnose, cure, treat, or prevent any illnesses. Related: The Loving Naturals Clear Lips is an organic lip balm that will protect your lips from the sun during all the hikes and camping trips, on top of being organic. Description: The Dr. Bronners Magic Bar Soap is one of the greatest gifts you can offer to yourself when planning to embark on a camping expedition. This product makes your bath experience feel like a spa. It’s excellent for your skin, especially if it’s prone to oil and breakouts. The Dr. Bronners Bar Soap has a peppermint burst so pure it tingles. The soap features peppermint oil to clear sinuses, sharpen the mind and cool the skin. The product is made with certified ingredients as well as organic hemp oil for smooth, soft lather that will not dry your skin. Dr. Bronners is a hundred percent biodegradable in a hundred percent post-consumer recycled wrapper, making it a completely environmental friendly soap, for those who really care. The soap is ideal for washing your clothes. 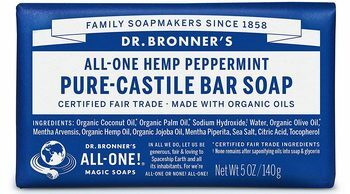 The natural ingredients used in the manufacture of Dr. Bronners Peppermint make it suitable for other applications including bathing, washing dishes, and washing hair. 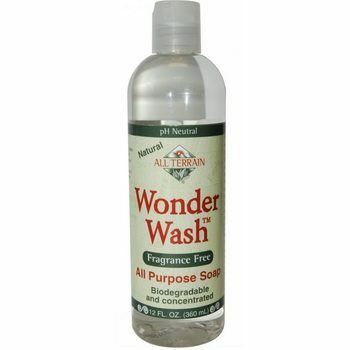 Related: The Dr. Bronner’s Z2EO84 Toothpaste is commonly bought with this soap. It’s compact and great for camping, as it’s organic. Description: The Outdoor RX 320 Camp Soap is a concentrated, biodegradable, and fragrance-free soap. This product is safe for cleaning dishes, your hands, hair, body, and more. Its fragrance-free formula works in salt or fresh water, and cold or hot temperatures. Being such a multiuse soap it’s one of the favorites, as you just need to pack this one and it will work for all your needs. However, being such multiuse, don’t expect it to work wonders on anything. Dispenser cap bottles can be found in different shapes and sizes. 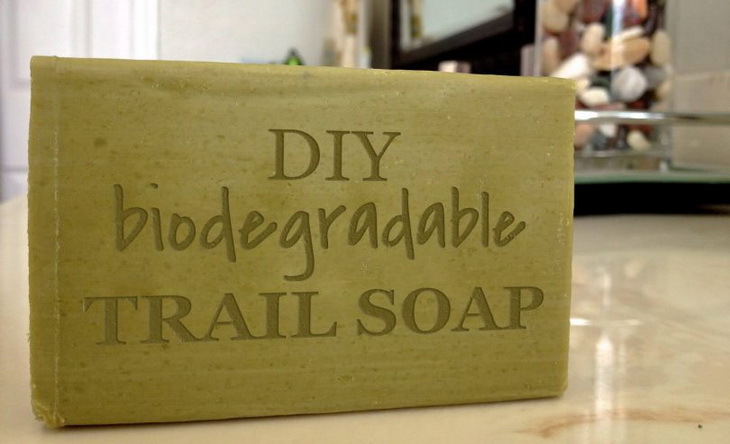 Due to its versatile nature, you can use the Outdoor RX Biodegradable Camp Soap your backpacking trips for soap application. On the downside, this soap doesn’t always lather with ease, but this isn’t a deal breaker because it functions perfectly where biodegradable soaps are a must. Therefore, when you are thinking about getting soap that is not harmful to the environment, the RX Biodegradable Soap is one of the options to consider. Related: The Coleman’s 14874 Camper Toilet Paper is a good product to buy for any camping trip. They are biodegradable sheets that come in really handy on any camping trip. Description: The Sierra Dawn 1 Campsuds Cleaner is an ideal product for backpacking and camping. This soap is suitable for laundry, bathing, washing dishes, and cleaning your hair. 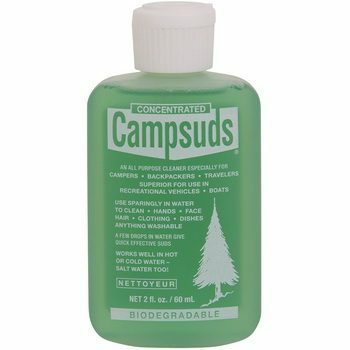 The Campsuds cleans everything on its way and does not leave residue on clothes, dishes, or people. What’s even more intriguing about using this soap for your outdoor application is the fact that it is environmentally-friendly. When you are planning to go on a camping trip, you can carry an empty Campsuds bottle that has a lid and another large-sized Campsuds bottle in Nalgene (because Nalgene does not leak), and then use it to fill the smaller bottles. Campsuds will not disappoint you. It’s a great concentrated soap with different kind of uses. 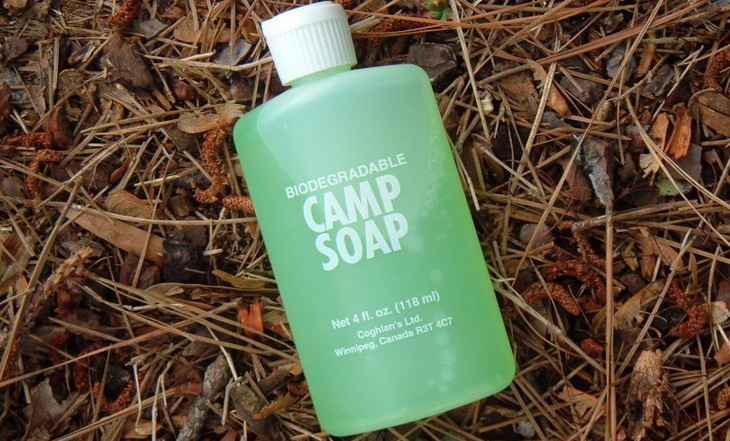 During camping, you can use it as shampoo, a hand soap, a dish soap, and more. You will also love how the soap smell. Additionally, it doesn’t react or cause any allergies on your skin. Related: The Aquamira 41001 Water Treatment Drops are commonly bought with this soap. Not only will the soap keep you and your things clean, but the drops will ensure that your water stays clean during your camping trips. Biodegradable products are usually environmental-friendly as these are easy to break down through the natural bacterial processes. When going on a camping expedition, always ensure you select products that are biodegradable. Also, do not forget that nothing stops you from utilizing these products at home as they are suitable for both indoor and outdoor applications. We hope that this article allowed you to take a look at the important features, but especially at the different types of products so that you can then go camping and take with you the soap that suits you the best. So, have you used biodegradable products before? Please let us know about the best products you have used. You can leave your suggestions in our comment section below.